Substantially pigmented rich, dark cranberry jelly hue with aromas of over the top vegetal bouquet on opening that gives way to big, dark fruit, ripe plum, baker's chocolate. loads of forest floor and cedar with more fruit behind. Palate--Bold, full bodied,vibrant, rich intense berries and other dark fruits with a sharp cocoa beam with a lengthy finish of spices, subdued fruit and rustic meadow flavors. Concha Y Toro and I have had a relationship since the mid 70's. They were a big part of my early wine exploration and they have only continued to make their mark in the world wine arena. 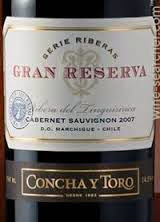 This is a classic Chilean Cab and Concha Y Toro does Cab WELL! No matter the price point of any particular varietal, their wines are generally super values and this is no exception. I can't remember what I paid for this but seems to sell for around $15. At this price point, it is a BIG wine and lot for the money so grab some and reward yourself laying a few bottles down for a few more years and you won't be disappointed so raise a glass!